We can practically hear you working on your "mwuahahahaha" already. Because this isn't just any old cape. 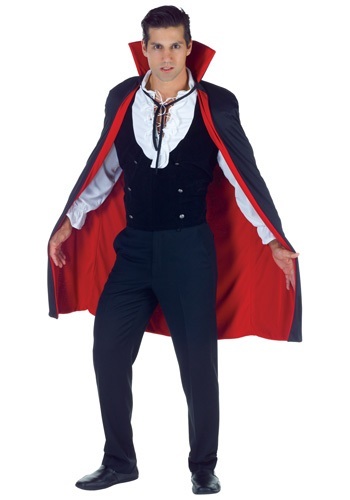 This elegant garb captures the style preferred throughout the centuries by provincial dukes, castle-dwelling counts, and oh yes, blood-sucking vampires and probably even the prince of darkness himself. You will be truly worthy of all those fine ghouls and madmen when you throw this Black and Red High Collar Cape over your shoulders! With a black outer-shell and an eye-catching red lining underneath, there will be no doubt that you are an agent of evil... who most likely sleeps in a coffin and drinks the blood of foolish mortals (and who is probably also the leader of the local neighborhood watch). It's sinister enough to work on its own, but also pairs great with our many vampire and Gothic-era accessories! So have a look around our site to complete your path to pure evil!